M.R. 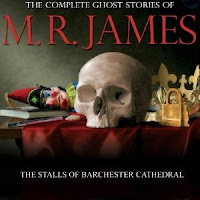 James' atmospheric short story "The Stalls of Barchester Cathedral" is among a number of ghost stories told round the fire in England. It has been adapted for television numerous times, both in England and in the United States. In the 1970s, it was broadcast as part of the BBC's A Ghost Story for Christmas series. It is available in book form and as an audiobook. For those so inclined, an in-depth narrative of the story is here. My "Barchester's Ghosts" is a humble adaptation of the story in verse, which I've arbitrarily conformed to couplets totaling three words and one, respectively (or vice versa). I offer it in response to poet David Wheeler's challenge to craft for this week's Random Acts of Poetry at The High Calling a poem about Noel Ghosts. The deadline for contributions is December 2, 6:00 p.m. PST. I also offer this for One Stop Poetry's weekly One Shot Wednesday event. Be sure to visit the site late Tuesday afternoon and evening and every Wednesday for links to the many contributors' "one shot" poems. I'm delighted to share the news that my poem "Not Because of You" is presented today at Red Lion Sq., along with a beautiful poem by Ken Hada. The fine audio recordings of the poems are part of Episode 24. Red Lion Sq., which launched this past summer, offers free weekly podcasts of contemporary poetry. It was founded by its host and co-editor Amy Watkins and co-editor Jae Newman, both of whom are poets. You'll find their biographical profiles and those of their team here. For information on submitting work to Red Lion Sq., please go here. Labels: audio recordings, poems, poetry, poetry readings, Red Lion Sq. Now I paint with my back to the world. The abstract painter Agnes Martin was born in Canada in 1912 and became a citizen of the United States around 1950. She had her first solo exhibition in 1958, at New York City's Betty Parsons Gallery, and then in the late 1960s stopped painting for seven years. She picked up her brushes again and returned to her canvas in 1974. In 1976, she produced a film, Gabriel. * Martin was inducted into the American Academy and Institute of Arts and Letters in 1989 and was the subject in 1991 of a retrospective exhibition organized by the Stedelijk Museum in Amsterdam; a second retrospective exhibition, at the Whitney Museum of American Art in New York, followed in 1992. She was honored in 1997 at the Venice Biennale. Martin, who lived in New Mexico for many years, died in 2004, age 92. I've provided below links to images of some of Martin's work. It's work to which I've always been drawn, because it is so subtle and highly reduced, its hand-drawn graphite vertical and horizontal lines elegantly precise (though not perfect) and almost imperceptible. The last time I saw an exhibition of Martin's work, at the Dia:Beacon, in Beacon, New York, I spent a long time just looking, thinking how intimate her paintings become when you sit quietly with them — you have to get close to try to see what's in them; also how contemplative, even moving they can be. While her work may not be to everyone's taste, I think it's gorgeous and deeply serene. It's as if she gathered up the brilliant light and colors of New Mexico and washed and rewashed them, over and over, until they've begun to disappear because whatever she might have come up with could never compete with what God created. Martin spoke thoughtfully and expressively about herself (especially about how she trained herself to stop thinking) and her work. Immediately below is a wonderful 20-minute interview with the painter, conducted by Chuck Smith and Sono Kuwayama in November 1997 at Martin's Taos studio. in order to do exactly what the inspiration calls for. And I don't start to paint until after I have the inspiration. that I'm not going to interfere. * The 16-mm film, transferred to DVD, was screened in June of this year at Lucy Cavendish College in the United Kingdom, in conjunction with an exhibition of Martin's work at Kettle's Yard Gallery in Cambridge. The film is described as the story of "a boy's relationship to nature and abstraction on a mountain odyssey". The show at Kettle's Yard, installation photos of which can be seen here on FaceBook (Martin's work does not reproduce well, I think), comprised work from Martin's later years and included 10 canvases painted in New Mexico between 1991 and 2002. Among many articles about Martin online are these: Ben La Rocco, "Agnes Martin, Peter Blum Gallery", Review in The Brooklyn Rail, March 2008; Holland Cotter, "A Series of Lines in Pencil, Leading to a Realm of Joy", Review in The New York Times, August 25, 2006; and Holland Cotter's Obituary for Agnes Martin in The New York Times, December 17, 2004.
a good poem is a good poem. . . .
Ami Mattison is a poet who also is a storyteller who brings her work to life through spoken word performances. I first had the pleasure of reading a poem of Ami's that she had posted to one of my poetry groups at the networking site She Writes. I have been impressed ever since not only with Ami's deep sensitivity to words and her understanding of words' use and power, but also with Ami's writing at her blog poetryNprogress, where you'll find posts on creativity, creative success and diligence, and many other informative essays on writing and professional and creative development. Ami also is a champion of other poets; at SheWrites, she offers perceptive comments on drafts and unqualified, unstinting encouragement. Ami is the author of a chapbook, Slug. Mojo. Poetry; has produced a demo CD, Strange and Potent Mixture; has published some of her writing in the anthology The Very Inside; and co-edited the anthology Not Your Mama's Cookbook (King's Crossing Press, 2002). She frequently leads writing and spoken-word performance workshops. I asked Ami to sit virtually with me for an interview, via e-mail; I am especially pleased to be able to share that interview with you now. Maureen Doallas: What influenced your decision to become a poet? Ami Mattison: Reading great poetry and falling in love with poets and poems during my college years propelled me towards writing and becoming a poet. Until that time, from childhood into young adulthood, I wrote primarily short stories, and I dreamed of becoming a novelist. While I loved poetry, writing it and becoming a poet weren't even on my radar yet. When I was introduced to the poetry and other writings of feminist poets Adrienne Rich and Audre Lorde, not only did I fall in love with their work; their writings showed me what was really possible with poetry—how it could change hearts, minds, and lives, how it could be located in personal experience and simultaneously illuminate how such experience intersects, collides, or becomes intricately interconnected with culture, history, and politics. With their lives and with their work, they were highly influential in my determination to write poetry and become a poet. At the same time, my friends were very influential in my pursuit to become a poet. In young adulthood, I hesitated to call myself a poet and to own that identity, primarily because I didn't think my poetry was very good. But I'd share my poetry with my friends, and they all were so supportive and loving about my efforts. They kept saying, "You're a great poet! Your poetry is brilliant!" And while my poetry was certainly not brilliant at that time, [my friends'] encouragement was invaluable and nurtured my identity as a poet and my work. MD: Do you recall the first poem you ever wrote? AM: The first poem I ever wrote was about my father, and I used the metaphor and descriptions of his hands to describe both his rough and his gentle nature. My parents asked me to read it to some family friends, and that was the occasion for my first poetry performance as well. MD: What most satisfies you about being a poet? AM: The actual work of poetry, playing around with language, and figuring out what language can and cannot seem to express are so much fun to me. Sometimes I get frustrated when I'm working and unable to express exactly what I want. But there is nothing quite like that feeling of stringing together words, making meaning, and expressing something more surprising and more honest than I had originally conceived. So, playing around with language and being surprised by what I write are the most satisfying parts of being a poet. MD: What prompted you to begin performing your work? AM: Throughout the 1990s, I presented my work in a number of literary readings. But these experiences were unsatisfying. In my writing, I was working very hard on the sounds and rhythms of my poetry, and I didn't know how to use my voice and my body yet to convey these sounds and rhythms. In 2000, I started going to an "open mic" called Cliterati, which at that time was exclusively for women writers. I really dug that scene, and the poets were doing different things with their voices and bodies, taking some risks and performing. So, I slowly but surely began to do the same. I began to memorize my work and began taking more and more risks. Before I left Cliterati, I was adding music to some of my pieces, collaborating with musicians, touring individually and with other poets (and actually making money), had recorded a demo CD, which I still sell at my performances, and working very hard to develop a unique brand of spoken word. MD: What would you describe as the difference(s) between writing a poem to be read and writing a poem to be spoken aloud? AM: A common search that drives readers to poetryNprogress is "how to write a spoken word poem". So, in an effort to answer this question, I've thought a lot about the differences between poems intended to be read from the page and performance pieces. However, I don't really have any definitive answers to this question. The interesting truth is, any poem potentially can be a spoken word piece. But the more successful spoken word pieces are easy to follow when listened to. Sure, most spoken word pieces need to be listened to several times to really understand their full meanings. But poets who are not writing for listening audiences don't seem so concerned about using seemingly cryptic metaphors and language that seems more like a code than some straightforward conveyance of thought. A lot of poetry intended for the page seems to be written for an audience well-versed and educated in poetry and literature. Spoken word poetry is intended to be understood and enjoyed by everyone and anyone. So, accessibility tends to set apart "page poetry" from spoken word poetry. In the final instance, I believe a good poem is a good poem, and it can be read from the page or it can be spoken, and its value and brilliance will shine, regardless of the medium through which it is delivered. MD: What makes a spoken word performance successful? AM: A successful spoken word performance requires, first, a good poem, one that resonates with a diverse audience. And it also requires several important components, such as meaningful, committed gestures and intonation and pitch of one's voice. For me, what always wins is passion—when a performer manages to emote passion in her performance of a poem and to convey love for what she's doing. And when she does it a unique, interesting, and fresh way, I never fail to be impressed and inspired. MD: In what kinds of venues do you perform? Which do you prefer, and why? AM: I've performed in many different venues: bars, cafes, theatres, hotel conference rooms, university classrooms, stadiums, outdoor stages, and even streets and sidewalks. Where I perform is less important than the conditions under which I perform. My favorite venues are small ones, where even a small crowd feels big because everyone is packed in tight and the energy is super-high. And I like to be relatively close to my audience so I can feel its vibe. I like to be able to see my audience; it's disconcerting to me when the stage lights are bright and the audience lights are dark. Not seeing my audience means I have one less physical sense through which to "feel" [my listeners] and understand how they're receiving my poetry. All that said, I do have a penchant for street performance. It's raw, exciting, and scary all at the same time. MD: What was your first performing experience like? AM: There are a few "first performances" for me. When I first started reading my poetry, I stood behind a music stand and tried to use my best serious "poet voice". You know the one—every line goes up at the end and sounds like a question. I was never good at "literary" readings. Trying to conform to some standard notion of how a poem must be read was never very fun. Another "first performance" was at an all-women's open mic, called Cliterati. I printed my poems on tiny pieces of paper and shyly read them to the audience. A final "first performance" was my first paid solo gig. It was in Philadelphia at a women's arts festival. I busted out a few raw poems in my typically loud way. And the audience got really excited. After my performance, the host told the audience to quiet down, because the poet coming after me was sort of a literary poet, using really obscure images and a serious poet voice. Man, that poet hated me! She glared at me after the show and refused to speak to me! MD: Thank you, Ami, for sharing with us thoughts about your craft. Next week, on December 6, I'll be sharing Part II of my interview with Ami, who will be discussing her writing life, themes and subjects in her work, the use of personal information in poetry, the influence of her Southern background on her writing, and writing for particular audiences. Until then, please listen to Ami perform live her "Anti-Love Poem" on this 2007 YouTube recording. you won't find in books about the great depression. mourning its way for lack of relief at the end of a bread line. our mothers' migration from their harvest-busted fields. not so good at masking the indifference we reflect back on you. and wanting till your time runs out. 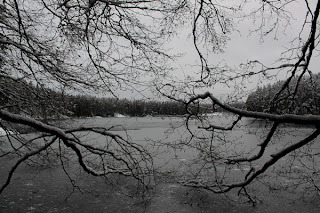 I wrote this poem for One Shoot Photography Sunday at One Stop Poetry, which today features a Picture Prompt Poetry Challenge using the image shown above. Anyone may participate in the challenge. Go here to read the two poems introducing the prompt, "The Day After..." by Leslie Moon and "Waste" by Pete Marshall, and to learn what to do to accept the challenge. My thanks to Christine Valters Paintner at Abbey of the Arts, where I first heard this recording. A sequel: "Light of the Presence - God the Mother"
Heaven on Earth Music Co.
From Gothic France to the Gettysburg Address to contemporary influencers, this edition of Saturday Sharing takes you through centuries of architecture, history, art, literature, and poetry. ✭ This animation of Abraham Lincoln's Gettysburg Address, read by Mitch Rapoport and designed and animated by Adam Gault and Stefanie Augustine, is beautifully done. ✭ Images, texts, charts, and historical maps are provided at Mapping Gothic France, a marvelous site, currently in beta, that allows you to consider the formation of France in the 12th and 13th Centuries in the dimensions of space, time, and narrative. The project is the work of Columbia University professor of art history Stephen Murray and Vassar College assistant professor of art Andrew Tallon, who collaborated with institutions' respective art departments and visual resources libraries. Be sure to visit Murray's Websites, listed here, including Amiens Cathedral and Medieval Paris; they are wonderful resources. ✭ The nonprofit Center for the Art of Translation, parent organization of the anthology and book series TWO LINES World Writing in Translations, Lit&Lunch, and Poetry Inside Out, promotes international literature and translation through publishing, teaching, and educational public events, such as the Two Voices reading series. ✭ Another wonderful resource is ARTstor, a nonprofit digital image library for education and scholarship and the primary image bank for Columbia University's Department of Art History and Archaeology. The digital library is open to anyone affiliated with a participating college or university, museum, public library, or K-12 school. Its collections comprise contributions from museums, individual photographers, scholars, special collections at libraries, and photo archives, including architectural drawings and renderings, stills of performance pieces, and outstanding examples of visual arts and material culture. ✭ The site Aluka (from the Zulu for "to weave") is an international and collaborative project to create an online digital library of scholarly resources about and from Africa. Among its collections are African cultural sites and landscapes, African plants (now at JSTOR Plant Science), and southern Africa's political struggles for freedom, which tracks and documents the liberation and independence movements in Botswana, Mozambique, Namibia, South Africa, and Zimbabwe. Content may be viewed by discipline (African studies, archaeology, art and art history, history, geography, and labor studies). Among its library tools are a 3D viewer that allows users to visualize buildings and structures in three dimensions and a page viewer that provides the experience of viewing digitized content as if from a book. Use of Aluka is open to nonprofit institutions of higher education, secondary schools, public libraries, museums, and other research and cultural institutions worldwide. Go here for additional information about accessing content in the collections. ✭ This full-version 13-minute documentary, Influencers, written and directed by Paul Rojanathara and Davis Johnson, seeks to identify influencers and how they affect creativity and trends in music, fashion, and entertainment. In October, six writers — Ali Smith, Amit Chaudhuri, Ruth Padel, Andrew Motion, Michael Morpugo, and Margaret Drabble — took up an invitation to select from the permanent collection of The Courtauld Gallery in London a painting that moves, engages, or challenges them and to offer their personal reflections on the piece chosen. In the first of two-program series hosted by Somerset House writer-in-residence Romesh Gunesekera, Smith spoke about Cezanne's The Etang des Soeurs, Osny, near Pontoise; Chaudhuri talked about Renoir's La Loge; and Padel reflected on Bruegel the Elder's Landscape With the Flight into Egypt. In the second program, Motion discussed Rousseau's The Toll Gate; Morpurgo examined Cezanne's Montagne Sainte-Victoire; and Drabble addressed van Gogh's Self-Portrait with Bandaged Ear. The writers' talks were recorded and are available as audio slideshows on The Guardian. Margaret Drabble's, Ali Smith's, and Andrew Motion's reflections are here, here, and here respectively. Michael Morpugo's talk is here. 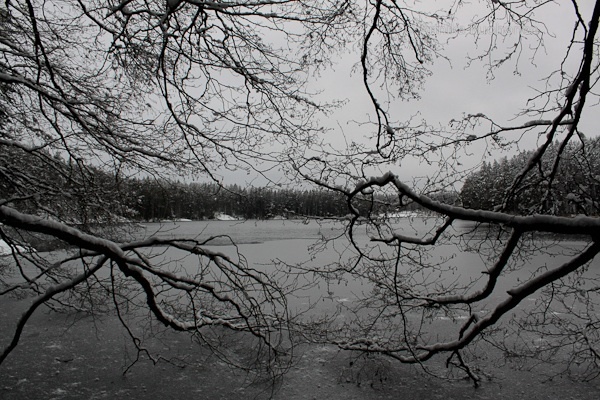 Check here for Ruth Padel's reflections and here for Amit Chaudhuri's. Podcasts subsequently will be posted on the Somerset House site. Previously, writer Ruth Padel was writer-in-residence at Somerset House and also undertook a "Picture This" series. Downloadable podcasts of that series' talks by writers Philip Pullman (Manet's A Bar at the Folies-Bergere), Julia Neuberer (Pissarro's Lordship Lane Station), Colm Toibin (Cezanne's Route Tournante), Gillian Beer (Vanessa Bell's Conversation), Hisham Matar (Cranach's Adam and Eve), and Jackie Kay (Degas' Woman at a Window and Lady with a Parasol) are available here, along with links to audio slideshows of the talks via The Guardian. These writers' reflections on art are well worth the few minutes required for listening time. Don't miss them! As this BusinessWeek article makes clear, most artists do not have health care. In upstate New York, a group of artists is collaborating with physicians to change that, by exchanging art for medical services via the "O+ Festival". Read on to learn more about the bartering project and its potential (or not) for replication elsewhere. Architect Frank Gehry, painters Ed Moses, Ed Ruscha, Tony Berlant, and Charles Arnoldi and sculptors Ken Price and Guy Dill are among artists displaying work through the "Keep Memory Alive" Art Consignment Program at Cleveland Clinic's Lou Ruvo Center for Brain Health, Las Vegas, Nevada. Proceeds from sales of the artworks, which range from $400 to $150,000, support clinic initiatives to promote awareness of and fund research for prevention, early detection, and treatment of neurocognitive and neurodegenerative disorders, including ALS, Alzheimer's, and Huntington's and Parkinson's diseases. James Rosenquist is the most recent artist to donate a work to the center, which was designed by Gehry. Rosenquist's painting Cervello Spazio Cosmico ("Brain Space"), 20' x 10' and a gift from real estate developer and art collector Steve Wynn, who commissioned it, was unveiled November 20; it will hang permanently in the Events Center. Peter Alexander's sculpture Glass Pyramid was the first such donation. A catalogue of paintings, sculptures, and other works of art available through the consignment program is here. E-mail inquiries may be directed to info@keepmemoryalive.org/ . For an article about Las Vegas businessman Larry Ruvo, who established the Keep Memory Alive organization, see "Pioneering Brain Health in Las Vegas" (Cleveland Clinic Magazine, Summer 2010). A national grant-making and artist-advocacy organization, United States Artists launched in 2005 with $22 million in funding from the Ford, Rockefeller, Prudential, and Rasmuson foundations. The seed money enabled the organization to initiate USA Fellows, which awards annually to 50 artists unrestricted $50,000 grants. On December 7, USA Fellows will announce in New York City its grant recipients for 2010. This year's applications came in from 301 nominated artists representing 46 states and a wide range of disciplines, including architecture and design, craft, dance, literature, music, visual arts, theatre arts, and media. (More than 80 percent of artists awarded grants create original works or projects.) The USA Fellows nomination and selection process is described here. USA also operates in association with Rasmuson Foundation a fully funded annual residency program in Alaskan cultural institutions, Alaska AIR, which is open only to USA Fellows. ✭ In Baltimore, Maryland, one of my favorite museums, American Visionary Art Museum, is celebrating its 15th anniversary with a year-long exhibition, "What Makes Us Smile?" The show, on view through September 4, 2011, includes work by Patty Kuzbida, John Callahan, John Root Hopkins, Chris Roberts-Antieau, Robert Gilkerson, Carlos Zapata, John Waters, Pedro Bell, Reverend Aitor, Nadya Volicer, and Tom Wilborn. The show is co-curated by Matt Groening, creator of "The Simpsons", artist Gary Panter (think Pee-Wee Herman's Playhouse), and AVAM founder Rebecca Hoffberger. In addition to the artworks, toy assemblages, costumes, cartoons, and "out-loud & 3-D glee-filled surprises" round out the exhibition and commentary on the history and science of laughter. Separate mini galleries — "Ho-Ho-Ho Ha-Ha-Hanukkah", "More Tickle! ", "Toot Suite! ", "Holy Laughter! ", "Tears to Laughter", "Boo! Why Playing Monster Is Fun", and the "Visionary Kid's Room" — offer experiential pleasures. A five-minute PBS Art Beat video highlighting AVAM and its exhibition is here. ✭ New York City's Museum of Arts and Design has mounted "What is African? The Global Africa Project", on view through May 15, 2011. The show comprises contemporary African art, design, and craft by more than 100 artists working in Africa, Europe, Asia, and the United States and the Caribbean and encompasses ceramics, basketry, textiles, jewelry, furniture, fashion, and selective examples of photography, painting, sculpture, and architecture. Among the exhibiting artists are Victor Ekpuk, Sheila Bridges, Sonya Clark, Mary A Jackson, and Magdalene Odundo. Images of selected works are available here. ✭ Notions of modernity and femininity and women's roles in Georgian England are examined in "Thomas Gainsborough and the Modern Woman" at Cincinnati Art Museum. The show, on view through January 2, 2011, features Gainsborough's portrait paintings of women, including the newly restored Ann Ford (later Mrs. Philip Thicknesse), an oil on canvas dating to 1760. The exhibition will travel next year to the San Diego Museum of Art, where it's scheduled to open on January 29; an installation there of 18th Century dresses will complement the show of master paintings. ✭ Richard Gray Gallery in New York City is exhibiting "Roy Lichtenstein: Modern Paintings" through December 11. Organized with the Roy Lichtenstein Foundation and drawn from private and public collections, including those of the Hirshhorn Museum and Sculpture Garden in Washington, D.C., the show includes more than 60 paintings executed in 1967, as well as accompanying drawings. The gallery also has published the first scholarly catalogue of the works in the exhibition. Eleven images are available online, beginning here. ✭ Japanese woodblock prints are the focus of "Dreams & Diversions" at the San Diego Museum of Art and University of San Diego. The exhibition, continuing through June 5, 2011, comprises exemplary examples of the Japanese prints in the museum's collection, spanning the history of Ukiyo-e. The prints, including important work by Katsushika Hokusai and Utagawa Hiroshige are arranged thematically and chronologically. Suddenly, you see the world lit differently. I give thanks today for the poets and other artists of our world. Through their eyes, we see and what we see we see differently, and so have hope, even in these most violent of times. The video below, "Hudson River Valley Autumn", was created by Westchester, New York, photographer Tom Warren; the music is by Taylor Haywood. My thanks to OnBeing blog, which highlighted the video in a post yesterday, noting that it was inspired by a program about the late Irish poet and philosopher John O'Donohue. Happy Thanksgiving to all of the members of my family and to all of my friends, throughout the United States and abroad, who enrich my life daily. "The Greenhouse" is found in Zagajewski's collection Mysticism for Beginners, translated from the Polish by Clare Cavanagh (Farrar, Straus & Giroux, 1998). The poem is on page 11 of the book as it appears on GoogleBooks, accessible here. The book is available for purchase through resellers via Amazon. Last night I took part in a TweetSpeakPoetry jam that used Monopoly game-inspired prompts. By the end of the poetry party, nearly 300 bits of poetry had been contributed. Participants have been asked to create their own mash-up poem or poems from the stream of prompts and tweets; to post the poem(s) online; notify @tspoetry in a @reply on Twitter, with a link to the poem(s); and add the poem(s) link here, where an archive is being maintained. Below is a series of short poems I've crafted from fragments of lines tweeted throughout the hour. In addition to using my own lines, I've borrowed bits and pieces from other participants: @jezamama @lindachontos @llbarkat @loonydaray @mattpriour @mdgoodyear and @tspoetry. It's not every day you'll get the chance to hear a musician play a hurdy-gurdy (in French, vielle a roue, meaning "wheel fiddle"), a heavy instrument with a handle or crank, sometimes likened to a barrel organ but, technically, a bowed string instrument. The hurdy-gurdy, which produces its own unique sounds, particularly in combination with the human voice, figures in the folk music of Spain, Italy, France, and the United Kingdom. In this brief video, viellist Caroline Phillips, who performs Basque music with Mixel Ducau — together, they make up Bidaia — provides a bit of history about the instrument and then demonstrates both her own and the instrument's wondrous sounds. To hear tracks from Bidaia's album Duo, go here. 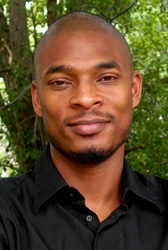 Poet Terrance Hayes, a professor of creative writing at Carnegie Mellon University, in Pittsburgh, Pennsylvania, is the recipient of the 2010 National Book Award for Poetry, for his collection Lighthead (Penguin, 2010). 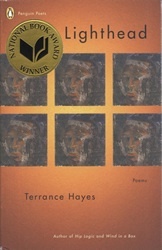 Hayes has published three other collections: Wind in a Box (Penguin, 2006), included in Publishers Weekly Best 100 Books of 2006; Hip Logic (Penguin, 2002), which was a 2001 National Poetry Series winner; and Muscular Music (Carnegie Mellon University Press, 2005; Tia Chucha Press, 1999), which was awarded a Kate Tufts Discovery Award. In addition to a Pushcart Prize, Hayes has been awarded a Whiting Writers Award, and a National Endowment for the Arts fellowship. He also received a Guggenheim fellowship in 2009. In this video recorded for a PBS NewsHour ArtBeat program, Hayes reads "Fish Head for Katrina". Enjoy! Hayes is an excellent reader of his own terrific work. Jeffrey Brown's ArtBeat interview with Hayes, "For Hayes, Pittsburgh and Poetry Are No Strangers", was broadcast in April 2008 and can be found here. An extended interview and reading with Hayes, produced for the NewsHour's Poetry Series, are here. Terrance Hayes Page at Penguin.com and Video Page at "The Reading Room"
David Allan Evans is Poet Laureate of South Dakota. He accepted the appointment June 15, 2002, succeeding Audrae Visser, who served from 1974 to 2001, and Adeline M. Jenney, who began her term in 1958 and served until 1973. "Coyboy poet" Charles "Badger" Clark, the first state poet, served in 1937. The position was established formally under state law (South Dakota Codified Laws, Sec. 1-22-7) in 1959. The Poet Laureate, who is recommended by and serves at the governor's pleasure, must be a resident of the state and must have written and published poems of "recognized merit" prior to appointment. As Poet Laureate, Evans regularly gives readings and lectures, conducts workshops, attends book festivals, judges state-level participants in the Poetry Out Loud contest, and also participates in related literary events in South Dakota and elsewhere. hadn't read them or heard them spoken aloud. . . .
David Allan Evans, who began writing poetry in his twenties, has published more than a half-dozen collections of poetry and has written or edited at least seven other books, including short stories, essays, memoir, and journals. His poetry books include This Water. These Rocks (San Francisco Bay Press, 2009), The Bull Rider's Advice: New and Selected Poems (Prairie Plains Series/Center for Western Studies, 2003), the chapbook After the Swan Dive (Finishing Line Press, 2009), and Decent Dangers (Edwin Mellen Poetry Press, 2000). Evans' poetry and other writings have appeared in many literary magazines and journals, including Kansas Quarterly, Prairie Schooner, Georgetown Review, The Briar Cliff Review, North American Review, and South Dakota Review, as well as scores of anthologies, among them Heartland II: Poets of the Midwest and Motion: American Sports Poems, and A Harvest of Words: Contemporary South Dakota Poetry (Center for Western Studies, 2010). Characterized in profiles as one of America's best-known sports poets (he attended college on a full football scholarship and also was a pole vaulter), Evans also writes meditative, reflective poems and strong narrative poems that are situated especially in the American Midwest of small towns and farms and resonant with his observations and understanding of relationships. He packs his "inhabited" poems with details, vivid verbs (he calls verbs "the guts of language, the guts of poetry, along with nouns"), similes, wordplays, and, often, humor. Sometimes he punctuates his poems, sometimes he doesn't. He tends toward short poems, with only a few unadorned, plain-spoken words per line. His style is usually straightforward and matter-of-fact. on the event. Frost is a superb example of this. Evans' "Bullfrogs" (animals in the natural environments are among the poet's subjects) is another well-known poem. Note the details that set the scene, the short lines, the concluding line that provokes thought. why hold back your love? Now retired as professor of English and writer-in-residence at South Dakota State University, Evans has been awarded two Fulbright Scholar grants for study in China and was the first South Dakotan to receive a grant from the National Endowment for the Arts. He also has received writing grants from both the Bush Foundation and the South Dakota Arts Council. In 2007, he was honored with the Sioux Falls Mayor's Award for Excellence in Literary Arts and in 2009 with the Governor's Award for Creative Achievement.